Gorgeous Beach home, Gulf is directly across street with beach access, Sound is steps behind home!!! Does not get any better than this! Spectacular 5BR (1 is a bunk room for kids) (Double master suites one on each level) 4 full, 1 half bath with 3, 000 sq. ft. of open living space Plus 4 private decks to see the amazing views from all directions! Built above the latest codes on the beach for lower insurance costs and incredible strength. Foundation was over engineered as well as the house itself. 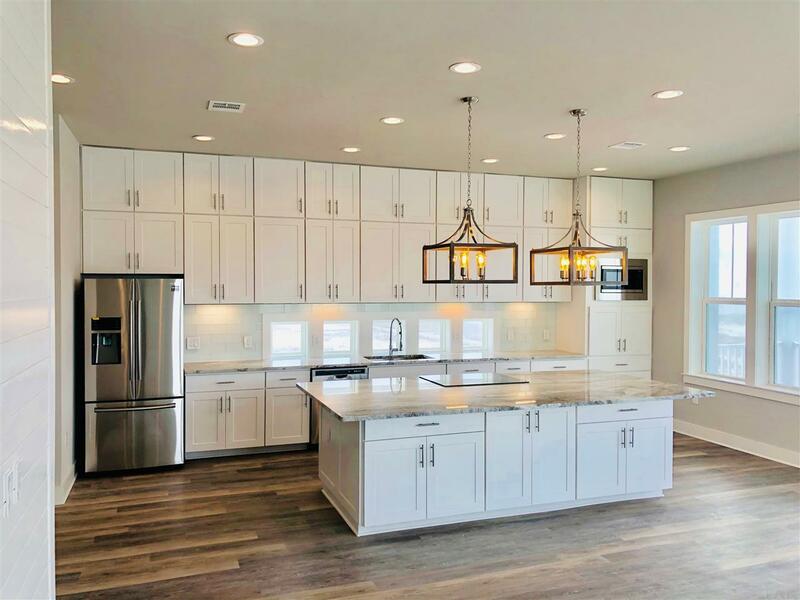 Home boasts painted shaker cabinetry (kitchen cabinets to ceiling) throughout, high end marble/granite slabs and under counter LED lighting. Signature windows built in to kitchen counter tops for natural light. Open floor plan with huge great room and massive kitchen island for entertaining with Samsung built in cook top. Kitchen is large and boasts stainless appliances. Suites have private Trex decks offering spectacular views of the Gulf of Mexico along with Santa Rosa Sound. First level master suites have floor to ceiling porcelain tiled shower with glass enclosures, double vanities with under mount sinks, chrome faucets, high end granite counter tops and separate acrylic tub with free standing waterfall faucet system. Second master suite upstairs has massive private deck overlooking the Gulf of Mexico, double vanities with under mount sinks, upgraded chrome faucets, high end granite counters, floor to ceiling porcelain tiled shower with glass enclosure. Two additional bedrooms upstairs with private deck and amazing water views. Additional upstairs bunk room with electrical and cable for multiple gaming systems and flat screens. Full laundry downstairs with storage/owners closet and wash sink. Recessed LED lighting throughout home. Designer color pallet, along with architectural delights throughout elevation of home and roof lines, exposed rafter tails. Only steps from the Emerald waters and white sand beaches of the Gulf of Mexico. 10 Year structural warranty included!